The UCSI welcomes our new half-time consulting minister, Emily DeTar Birt. Each person plays a vital role in the shared ministry of our church. Minister EMILY DeTAR BIRT is a Unitarian Universalist minister and the half-time consulting minister for the Unitarian Church of Staten Island. She served as the sabbatical minister for the First Unitarian Society of Westchester, after serving as the ministerial intern there. She also served as the first intern for the Unitarian Universalist Minister’s Association. She mainly facilitated and plan for the Beyond the Call: Entrepreneurial Ministry Program, which helped to train ministers and lay leaders in non-profit business skills to better plant new ministries and revitalize churches. She graduated from Union Theological Seminary in 2015. Over the span of the last seven years, Emily has served six congregations, as well as other organizations. 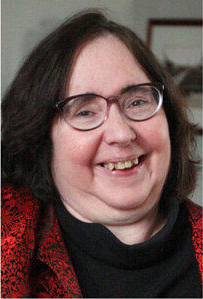 Director of Music, CAROLYN CLARK, D.M.A., (above) holds a Doctor of Musical Arts Degree from the Manhattan School of Music. As a French hornist, she has performed throughout the US and Canada. She is Executive Director of the Staten Island Philharmonic and a Staten Island Advance 2014 Women of Achievement award recipient. Committees form the backbone of our congregational life. You are warmly invited to participate in the committees, except as noted. For information about a committee and how to become a member, or to express a concern in a particular committee's area of interest, please contact us. The dedication of our Black Lives Matter banner on the steps of our church, May 22, 2016. The Unitarian Church of Staten Island is a member of the Unitarian Universalist Association of Congregations. Unitarian Universalism is the result of the merger of two separate denominations: Unitarianism and Universalism. Originally, all Unitarians were Christians who did not believe in the Holy Trinity. Instead, they believed in the unity, or single aspect, of God. Unitarianism emerged in America in the early 19th century, stressing the importance of rational thinking, of each person's direct relationship with God, and of the humanity of Jesus. American Unitarianism went through many changes, from the introduction of transcendentalist thought in the mid-1800s and humanist thought in the early 1930s. These contributed to the evolution of American Unitarianism into a more broad and flexible faith. As a theological doctrine, Universalism was a direct response to the Calvinist concept of predestination, that only the elected are chosen by God for salvation. Universalists held that all human beings will eventually be saved. Because of its loving and inclusive doctrine, Universalism quickly became popular in America, and the Universalist Church of America was formed in 1793. After growing increasingly theologically and ethically close, the Unitarian and Universalist denominations consolidated in 1961 to form the new religion of Unitarian Universalism. Although Unitarian Universalism no longer solely holds traditional Unitarian or Universalist beliefs, it does draw directly on its heritage for much of its inspiration and grounding. During the mid-nineteenth century, the population of Staten Island numbered just over 15,000, with many newcomers from New England settling on the North Shore in Stapleton and New Brighton. On October 24, 1852, two congregations of liberal Christians, the New Brighton group known as the Congregational Church of the Evangelists and the United Independent Church of Stapleton, incorporated in what then became the Church of the Redeemer. Established in the Unitarian denomination, in 1853, the Church of the Redeemer opened its first building near what is now Victory Boulevard and Cebra Avenue. It called the Rev. John Parkman, a Unitarian minister originally from New Hampshire, to lead the conjoined congregations, which he had served separately prior to their merger. 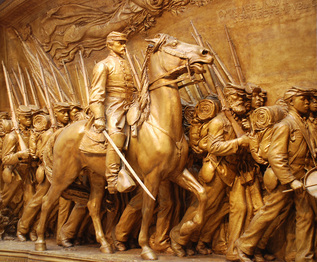 Memorial to Robert Gould Shaw and the 54th Regiment at the National Gallery of Art. Francis George Shaw, a Bostonian businessman turned philosopher and philanthropist, settled on Staten Island in West New Brighton with his wife Sarah Sturgis. Socially-conscious and deeply devoted to intellectual and spiritual pursuits, the Shaws became founding members of the new Unitarian church. The best known of their children, Robert Gould Shaw, and Anna and Josephine Shaw, were deeply influenced by their parents’ commitment to social justice. Robert, who famously led the 54th Massachusetts Regiment composed of freed slaves in the fateful Civil War attack on Battery Wagner, Morris Island, SC, was immortalized, along with his regiment, in the film Glory. Anna was married at the Unitarian Church of the Redeemer to George William Curtis in 1856. Curtis, another New England transplant to Staten Island was an author, editor of Putnam’s Magazine, and columnist for Harper’s. He was an abolitionist and supporter of civil rights for African Americans and Native Americans. He also advocated women’s suffrage, civil service reform, and public education. Josephine married Charles Russell Lowell, Jr., in 1863 in the same little church where her sister was married. Lowell graduated from Harvard in 1854 at the head of his class but when the Civil war began he demanded a commission as his patriotic duty. Josephine joined him in Virginia to help care for the sick and wounded. He was fatally wounded in the Battle of Cedar Creek on October 19, 1864 and was promoted brigadier general of U.S. Volunteers. He died on the next day at Middletown, Virginia, at the age of 29. Josephine and her young daughter Carlotta, born one month after his death, returned to Staten Island to live with her parents. The Underground Railroad was in use during this time to help runaway slaves, and it is believed that the Curtises and the Shaws were very involved in this effort. The Shaw sisters and their mother, Sarah Sturgis, also spearheaded local efforts to help the war effort. George Curtis was targeted by Southern sympathizers and, during the draft riots in NYC during 1863, Anna and her three children left Staten Island temporarily for the safety of her grandparents’ home in Roxbury Massachusetts. The Curtis and Shaw families, rooted as they were in the liberal soil of New England, counted among their close associates Emerson, Hawthorne and Thoreau. This history was adapted from writings of UCSI Minister Emeritus Benjamin Bortin; Bradford Green, UCSI historian; and Susan McAnanama, long-time congregation member. To learn more about the church's history download this PDF.